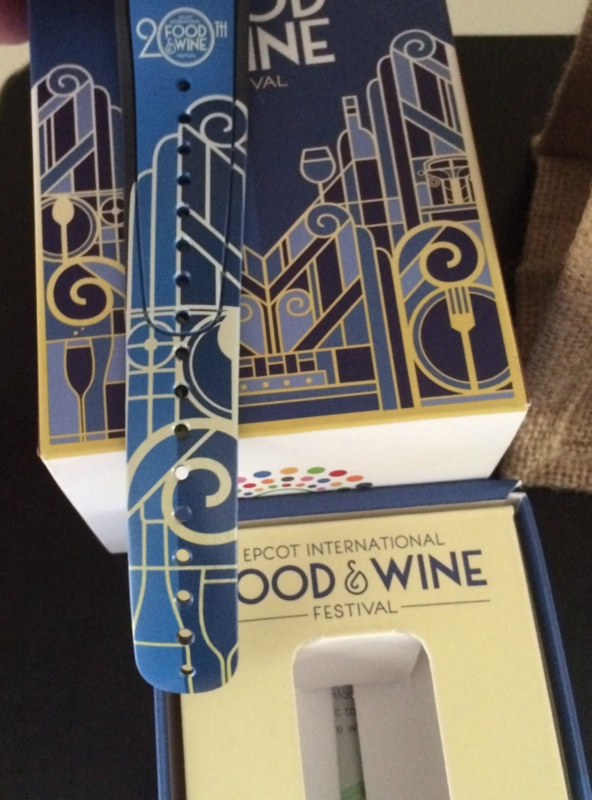 The first pictures have appears online of the 2015 Epcot International Food & Wine Festival Premium Package MagicBand. 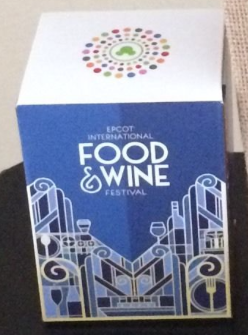 Although most Premium Package guests won’t be able to get their MagicBand until Monday (the first pickup date for the package at the Festival Center), someone has been able to get it early on Friday, September 25th, 2015, and after asking him I found out that you could pick your package up today if you booked for next week’s package. Again, you can only get this MagicBand if you have the Premium Package booked, which costs $200 per person, and is not available to regular guests. As you can see, the band does come in a box, symbolizing that this band is indeed Limited Edition as I expected. What this means is that it probably makes the “wine pouring” lights and sounds at FastPass+ touchpoint that I predicted it would have earlier. The design is also pretty much exactly as I had guessed. I’ll post more on Monday when I pick up my band and can confirm/deny this in person. What is interesting is that the edition size of the band is not printed anywhere. For now, take a look! 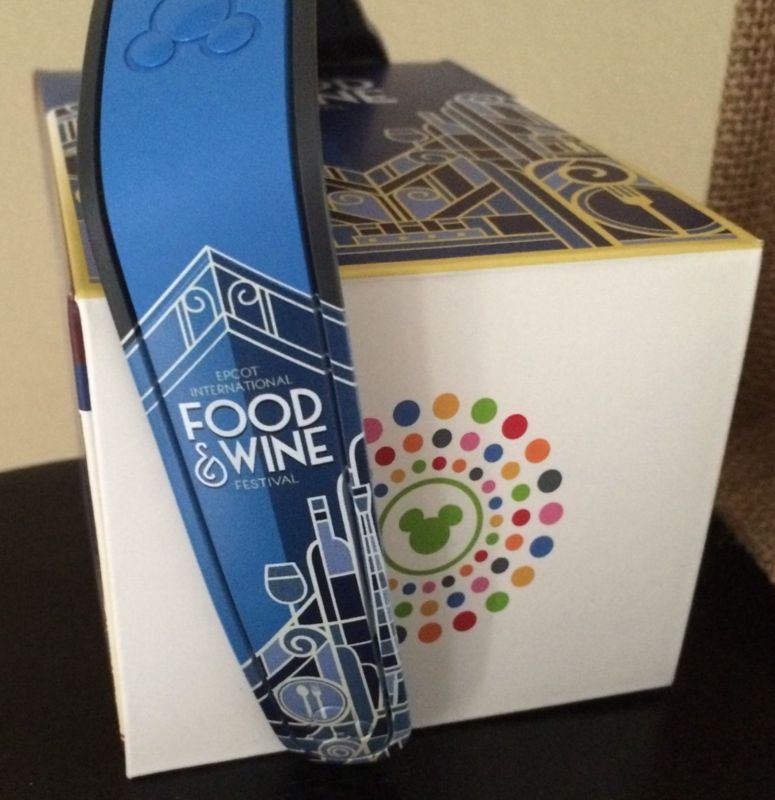 4 Responses to "First pictures of the new 2015 Epcot Food & Wine Festival Premium Package MagicBand"
I just started collecting last summer. I was able to obtain the Not So Scary Halloween band and the Food and Wine Festival band this weekend. Do you know if there will be anymore limited editions coming out between now and Christmas? I will be back at WDW November 22, Disney cruise, then back again on 28th. I was hoping there may be another limited edition I could obtain during those dates. Any information on upcoming limited editions would be great!! The only one that I know of that is possibly going to be released between now and the end of the year is the Mickey’s Very Merry Christmas Party MagicBand. But I honestly have no idea beyond just speculating. Do you remember the approximate date they first released it last year? And were they only selling them in certain parks/stores? Certain days? Last year’s was also only available for the Premium Package guests. They weren’t sold in stores.